If that sounds grim, it is. Smick isn’t bashful about diagnosing the profundity of the economic challenges facing the United States, and he shouldn’t be. The problems that he recounts—from a rigged alliance between powerful corporations and Washington policymakers, to a declining labor-force participation rate, to immense private and public debt—are doozies. This blind spot, in which he fails to see that his diagnosis and prescription may be flawed just like those of other experts, is one of his weak spots. Another is his tiresome habit of recounting his own glorious encounters with big-timers like Lee Iacocca, Ronald Reagan, and Jamie Dimon (though on that last one, at least, he rightly notes that financiers’ fascination with Dimon is totally backward). Still, there’s a whole lot that Smick gets right. 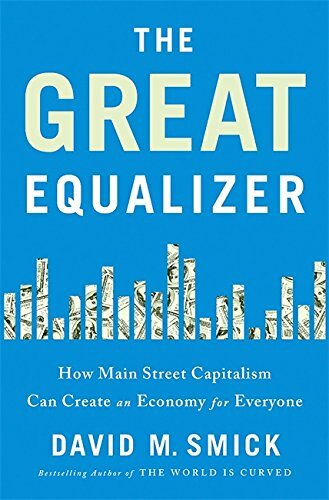 Early on in the book, he distinguishes between what he calls “Main Street Capitalism,” in which bullish entrepreneurs (especially women, he says) on Main Street U.S.A. open new firms in great numbers, creating wealth and jobs in the process; and “Corporate Capitalism,” in which powerful companies “fixate on survival by dominating the government’s levers of power to protect the status quo.” Our system is the latter, not the former. Significantly, he writes that the fate of our economy depends in large part on how people feel about things. When people feel bullish, they take risks and start businesses; when they don’t, they don’t. Right now, we’re not feeling good about much of anything (for good reason). His solution is ambitious, as any solution to this web of problems must be. He lays out a 14-point plan that includes tax and immigration reform, reinvestment in education with an emphasis on community colleges, modest increases in the minimum wage, and lines of credit for small- and medium-sized businesses, among other interventions. Much to his credit, Smick calls out partisans on both sides, citing a damning study that found that survey respondents overwhelmingly liked a hypothetical plan for education reform when they were told the plan was supported by their own party, and overwhelmingly disliked the same plan when they were told it came from the opposing party; the finding held true for Republicans and Democrats. In The Great Equalizer, Smick issues a rallying cry for both sides to quit this absurdity. That cry will probably fall on deaf ears. Smick’s recommendations include issuing automatic green cards to foreign students at U.S. schools who earn degrees in math, science, business, and technology; it’s all but impossible to imagine a government led by Donald Trump taking up such a plan. But as Smick impresses upon us, no one knows what the future holds—and sometimes that’s a comfort. Mattea Kramer is author of A People's Guide to the Federal Budget.